You truly have to love your fried chicken to order a bucket on the new limited edition “KFC edition Huawei Enjoy 7”. Love KFC enough to buy a #KFC Phone ? Tag Someone who loves fried chiken ! Order your finger lickin’ fried chicken with the new KFC smartphone. KFC is celebrating its 30th anniversary in China by releasing a fire-engine red, limited edition smartphone – “KFC edition Huawei Enjoy 7”. KFC has partnered with Huawei for the phone’s release. The limited edition phones will cost $162 and only 5000 devices will be available. The smartphone is reported to have Colonel Sanders embossed on the back with the year “1987” and Huawei logo. The year marks the opening of KFC’s first store in China. The phone comes with a pre-loaded KFC-branded music app, which can be used to pick songs to play on the speakers at KFC restaurants in China. It also offers an additional 100,000 K-dollars, the restaurant’s digital currency. As per the smartphone’s specs, the $162 limited edition Huawei Enjoy 7 has a 5.5-inch LCD 1280 x 720 px display. 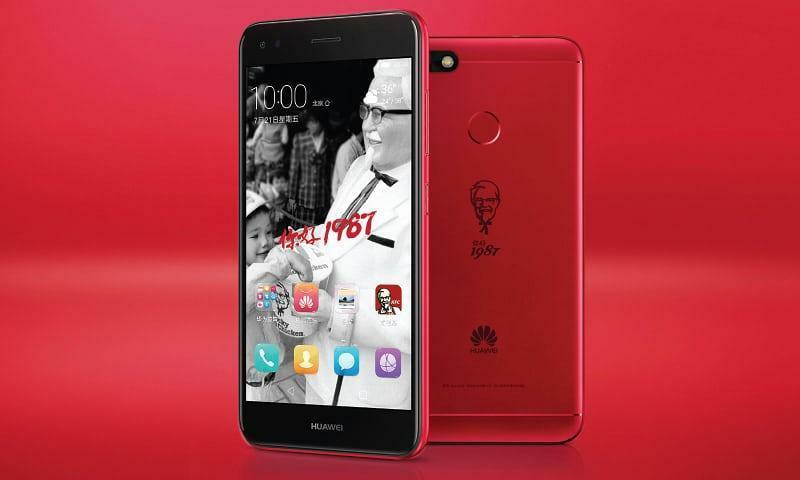 The Android based KFC Huawei 7 Plus comes in KFC’s signature red color and is powered by Snapdragon 425 processor. The smartphone also features 3GB of RAM and 32GB of storage with an option of up to 128GB of expandable memory. At a price of $162, roughly Rs. 10000, the Huawei Enjoy 7 has a fingerprint scanner at the back and an inbuilt 3,020mAh battery. This is not the first time KFC has launched a product other than the good old fried chicken. In May last year the company launched a range of KFC nail polish, which was, of course, edible and chicken flavored. Taking the “finger lickin’ good” slogan quite literally. The success of the chicken flavored edible nail paint was followed up three months later with the chicken-scented sunscreen. Yeah it smells like chicken in here!